Why is every town along the Thames referred to as 'upon Thames'? It's not on or upon it's next to. I can't find an explanation, maybe someone can direct me to the origins of this naming of places along the river. The Thames Path is the walkway along side the Thames from the source in the Cotswold's travelling 184 miles (296 kms) to the Thames Barrier, just past Greenwich. My walk this day was from Kingston to Richmond (about 5 miles). Either end easily reached by tube. This section is closer to Kingston and is the non-tidal part of the river. A mile or so from this section of the river is the Teddington Lock. The lowest lock on the river, it is the separation of the tidal and non-tidal part of the river. As for basket upon Thames. It is soon to be the new home for the planned family of a couple of birds. Rightly called 'upon Thames' I reckon. Now that sounds like a trip! Ever thought of walking the entire path? Just imagine all the sights (and the tired feet)! Is that path one of the many public footpaths around England? I had the pleasure of doing a five mile walk on one of those when I last visited England in June/July 2007. It was up in Lincolnshire, just outside of Grantham, on one of the paths in and around Harlaxton Village. It was one of the greatest walks/things I have ever done. moses basket for birds...good shot! Your photos make me want to see London! 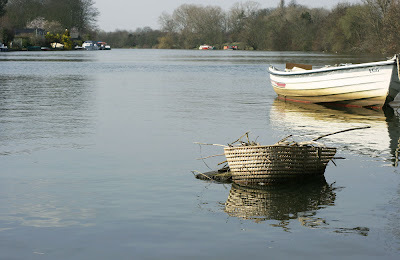 It makes me want to know the story of the basket upon the Thames. Who would throw such a thing in the river? Did they know the birds needed a home? I said London, but I do mean England! Certainly, there is much more to England than just London, as your photos attest! Perhaps you could start in London and I could start in the Cotswolds and we could meet in the middle! Lol! These baskets have a name but I can't remember it! You certainly are talented - so very unusual pictures, such a talent to grasp light! Sounds like a great path to (literally) go looking for signs of spring. And maybe return by tube, if those feet are tired by then. I just love walking along the thames, especially when it is sunny like today. I did the kingston-hampton court. It was wonderful! Nice photo...basket made me think of Moses in the bulrushes. I have no idea. Now you mention the upon on am intrigued. Gary lived in Kingston many years ago. Gorgeous image. A new family will be moving to Basket Upon Thames soon. Ooooo you took me back! So at some point you would have walked past Teddington lock and past my old rugby grounds...Ahhh them were the days. thanks Mo. Maybe I ought to pop back for a game sometime before I'm past it...Or was that what people write when they ARE past it?